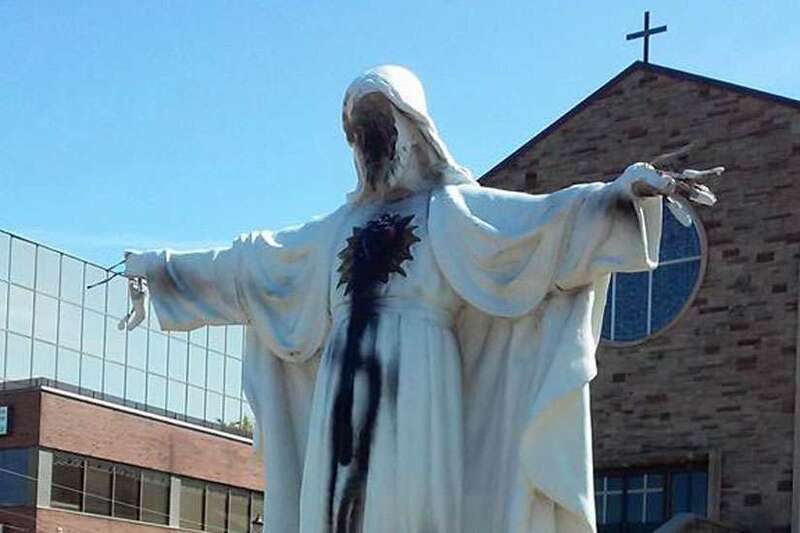 A 22 year-old Muslim was charged in connection with alleged hate crimes after vandalizing a Jesus statue in front of St. Catherine of Sienna Catholic Church in Ontario. Iqbal Hessan allegedly covered a Jesus statue in black and broke off its hands. A 22-year-old Mississauga man has been charged in connection with alleged hate crimes committed at St. Catherine of Siena Church and its neighbouring elementary school over the past two months. Iqbal Hessan was reportedly arrested in the early hours of May 26 on the Mississauga school’s grounds, though police would not confirm this. Hessan faces five counts of mischief over $5,000, and break, enter and commit indictable offence. A bail hearing was held later that day. It was the third time the church has been targeted. On April 9, surveillance footage caught a young man breaking into the church, ripping pages of the Sacramentary book on the altar and throwing them at the tabernacle. He is then seen stealing one of the church’s amplifier speakers. On May 17, a drawing of a hand gesturing with the middle finger was found spray painted on the front steps of the church. And on May 25, graffiti was sprayed on the school walls. But out of the vandalism has come a new sense of community. When news spread, the parish community and its neighbours began working together to get the church back to its original shape.